This article first appeared in Personal Wealth, The Edge Malaysia Weekly, on December 3, 2018 - December 09, 2018. More Malaysians over the age of 60 are hosting travellers in their homes through Airbnb. Doing so helps them cope with the rising cost of living and keeps them active in their golden years. A homeowner in Penang, who wants to be known as Sapur, is able to generate RM1,500 to RM2,000 a month doing this. She was one of more than 800 senior citizens in the country who collectively earned RM5.6 million in the past year (as at September). Sapur, her Danish husband and two sons had moved back to Penang in 1995 after spending more than a decade in Europe. Her husband was working for a Scandinavian company and was tasked with setting up offices in countries such as Italy, Denmark, France and Germany. “We were like nomads,” she says, describing the family’s wandering lifestyle, which had cultivated an interest in exploring foreign destinations and cultures. When her husband died five years ago, her younger son helped her set up an Airbnb hosting account to help her cope with the loss and enable her to generate a steady stream of income to support her in retirement. In no time, Sapur managed to become a “superhost” (Airbnb’s superhost programme recognises more than 400,000 hosts who “go above and beyond for every guest”). She attributes this achievement to her welcoming personality, her sense of wonder and the ability to get along with foreigners and travellers — things she honed during her “nomadic” days. “When my husband was around, he took care of everything and I was really spoiled. When he started to get very sick, I had to handle everything — including the financial responsibilities — and that made me appreciate all the things he went through to take care of the family,” says Sapur. She points out that while her 30-something sons provide financial support, they also have their own financial commitments such as mortgages and other loans. “I cannot expect them to take on everything,” she adds. Hosting on Airbnb is a viable source of income for her as she could not re-enter the job market after leaving it 35 years ago. She had worked in human resources and training for a private company before quitting to focus on raising a family with her husband. “I tried to get jobs, but because I was already 60-something, I was told to go home and rest. But I felt that I could still contribute, that I could do a lot of things,” she laments. Many other retirees share this sentiment. According to Siew Kum Hong, Airbnb regional director for Asia-Pacific, acknowledges that the senior citizen group in Malaysia is one of the fastest growing in terms of the number of hosts, with 51.37% year-on-year growth (from 584 seniors in September 2017 to 884 the following year). This, he notes, is much higher than the global and Asia-Pacific average (32% and 29% respectively). They are also the best-rated hosts (over 76.3% of five-star reviews). Meanwhile, the top three states in Malaysia when it comes to the year-on-year growth in senior citizen hosts are Sabah (95%), Selangor (86%) and Sarawak (77%). According to Airbnb, there are more than 400,000 senior citizen hosts on the platform worldwide. Last year, they earned over US$2 billion, hosted more than 13.5 million guests and welcomed travellers from over 150 countries. A global survey of Airbnb hosts found that nearly half of this age group said hosting had helped them to afford living in their homes while 41% said they relied on their Airbnb income to make ends meet. Siew says senior citizen hosts around the world choose to use the platform not only to sustain their lifestyle after retirement but also to live in the community they are familiar with. In addition to funding their retirement, they also want to age in place — to live in the homes they grew up or raised a family in, without having to move out after retiring. “[With the former,] they are worried about how to sustain the same lifestyle without eating into their nest egg. That is why we think [the average] RM8,500 a year that they earn via Airbnb is by no means a huge amount of money. But it is very useful in terms of topping up their income,” says Siew. In terms of listing styles, instead of renting out whole property units, most senior citizen hosts list rooms in their own homes, says Siew. This arrangement works out well for both the guests and the hosts as they are able to make the people-to-people connection that makes travelling with Airbnb special, he points out. “You get to learn about the way locals live, as well as their community and friends. We hear a lot of stories where the hosts’ friends come over and they later become friends with the Airbnb guests. Cultural exchanges would then happen,” says Siew. On the other hand, there are hosts who list their investment properties as well as their own homes. The latter is usually done when the hosts themselves travel, says Siew. “Sometimes, they may need help. For example, they may have cleaners coming in when they are away travelling. [When that happens,] they probably need someone to help [with the hosting],” he adds. 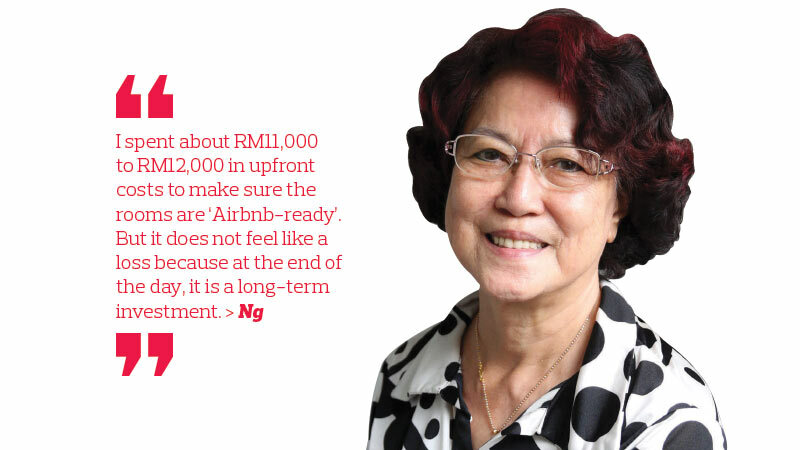 For Amy Ng, 73, her Airbnb earnings go towards paying her utility bills. She says she is able to earn up to RM2,000 in a good month. But on average, she gets RM400 to RM500. Despite this, she is not complaining as she describes hosting as a “happy experience because the travellers bring their own cultures with them”. The retired beautician and former yoga academy director from Cheras, Kuala Lumpur, decided to become an Airbnb host on her grandson’s suggestion, who thought that her effable personality would make her a popular host. True enough, Ng is now a superhost who lists three rooms after joining the platform in 2015. Initially, she found the app’s interface complicated. But with her son’s help, it took her less than a month to learn how to use it comfortably. 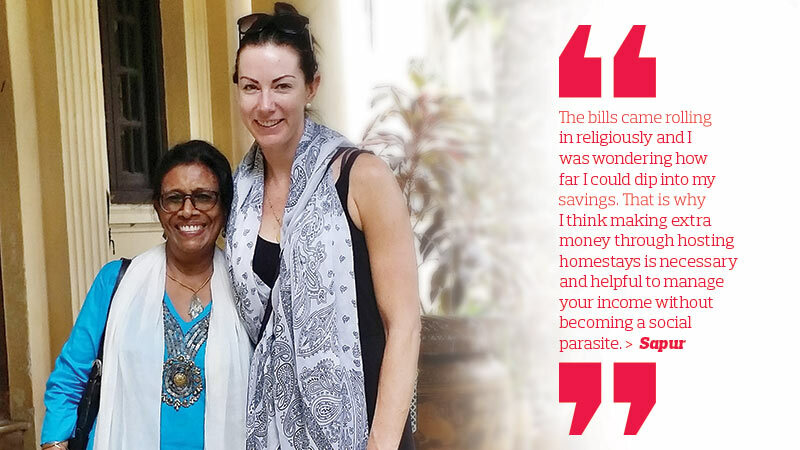 “I spent about RM11,000 to RM12,000 in upfront costs to make sure the rooms are ‘Airbnb-ready’. But it does not feel like a loss because at the end of the day, it is a long-term investment. I am planning to do this for many years to come,” says Ng. She loves travelling but cannot do much of it nowadays due to her health. However, she finds herself living vicariously through her guests, who share stories about their journeys. Thus far, her guests have come from Australia, Brazil, England, Germany, Russia, Turkey and the US. “I remain in touch with some of them after they left. One of the friends I made is a middle-aged man from China, who is travelling the world on a bicycle. We stay in touch via WeChat,” says Ng. Like many other senior citizen hosts, she interacts with guests over breakfast that she prepares. Sometimes, she brings them to popular tourist spots such as Jalan Alor in Kuala Lumpur, which is known for its street food. Hosting on Airbnb requires these types of interactions, in addition to the maintenance tasks, which allow senior citizens to remain engaged and active. Airbnb’s Siew describes this as “active ageing”. “Research shows that when people who have been working for decades stop doing so, retirement can take a toll on them as they can get lonely, isolated from the community and their minds are not actively used anymore. So, our hosts have found that the social benefits could outweigh the financial benefits,” he says.